This week we follow the Le Giornate del Cinema Muto in Pordenone, Italy. One of the programmes is Cineteca Italiana 70, a celebration of the fact that Luigi Comencini and Alberto Lattuada founded the first Italian Cinematheque in 1947: Cineteca di Milano. The programme includes the drama Il Fiacre n. 13/Cab Number 13 (Alberto Capozzi, Gero Zambuto, 1917), one of the most popular films of Polish singer and actress Helena Makowska (1893-1964). 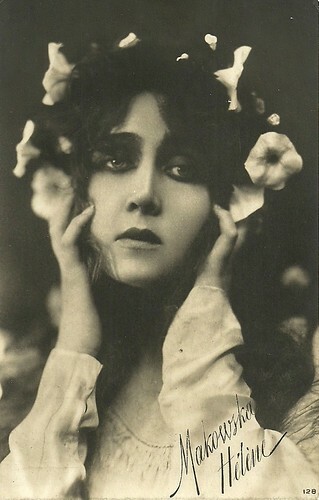 She was a beautiful diva of the Italian silent cinema in the 1910s. 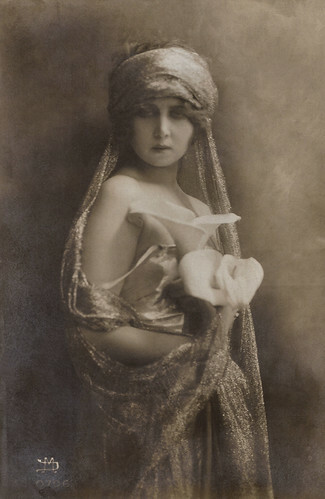 During the 1920s, she moved to Berlin and became a star of the German cinema. Later, Luigi Comencini directed her in La valigia dei sogni/The Suitcase of Dreams (1953) as the aged actress of the silent era who is visibly moved by seeing herself in Fiacre 13. Italian postcard by Ed. A. Traldi, Milano, no. 425. Italian postcard by Ed. A. Traldi, Milano, no. 467. Italian postcard, no. 30. Collection: Didier Hanson. Italian postcard by Ed. A. Traldi, Milano, no. 563. Helena (also Elena) Makowska was born Helena Woynowiczówna in Krivoy Rog, Russian Empire (now Kryvyi Rih, Ukraine), in 1893. She was the daughter of Ludwik Woyniewicz, a Polish engineer who worked for a Russian-Belgian company, and his wife Stanislawa née Sauret. At the age of 16, she married lawyer Julian Makowski, but the marriage was a brief intermezzo. 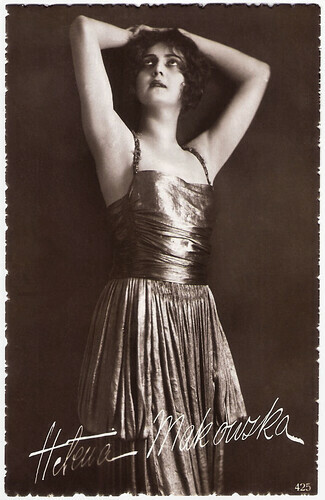 In 1912 Makowska went to Milan to take singing lessons. The following year she debuted at the Opera as Amelia in Il ballo in maschera and as Elena in Mefistofele. 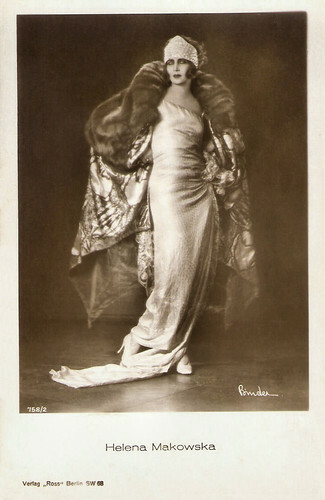 Her film debut was in the film Romanticismo (Carlo Campogalliani, Arrigo Frusta, 1915). It was based on a famous play by Gerolamo Rovetta, which was already filmed in 1913, and refilmed in 1951. Makowska is Anna Lamberti, whose husband count Vitaliano Lamberti (Tullio Carminati) would like to join the partizans, but is withheld by his pro-Austrian mother. His indecision has estranged him from his wife, who has an affair with a Polish profugee, Cezky, Vitaliano's secretary. When Vitaliano finally joins the freefighting patriots, he regains his wife's confidence, but her vengeful lover denounces Vitaliano to the police, then commits suicide. Even when warned, Vitaliano stays where he is, is caught and executed. 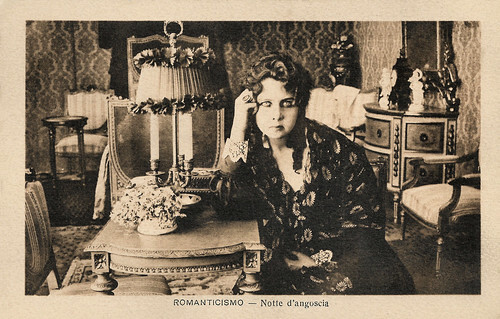 Romanticismo came out in Italy in September 1915, just a few months after the country had joined the Allied forces against Austria-Hungary and Germany in the First World War (April 1915). It was also Makowska's first film for the Torinese company Ambrosio. 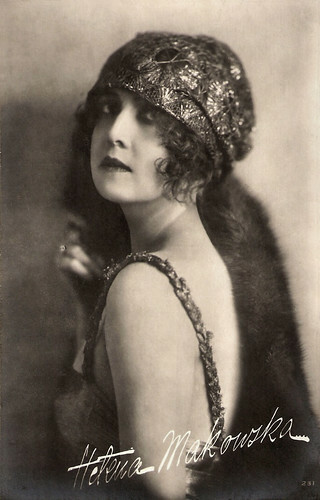 From 1917 on, she switched to other film companies and played Ophelia in Ruggero Ruggeri's Amleto/Hamlet (1917), the seductress Elena in the comedy Addio giovinezza/Good-bye Youth (Augusto Genina, 1918) with Maria Jacobini, followed by La dame en gris/The Lady in Grey (Gian Paolo Rosmino, 1919). Makowska would go on to perform in some 40 Italian films until her move to Germany in the early 1920s. The Italian press constantly praised her beauty but found her a bit stiff. Italian postcard by IPA, no. CT. 750. Photo: Film della Società Anonima Ambrosio, Torino (Turin). 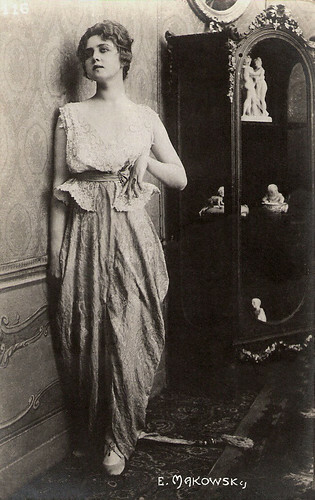 Still from Romanticismo (1915). Caption: Notte d'angoscia (Night of anguish). 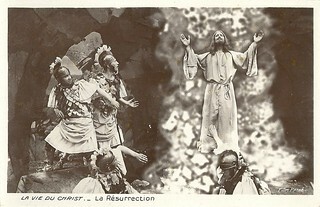 Italian postcard by IPA CT, no. 3876. Photo: Film della Società Ambrosio, Torino. 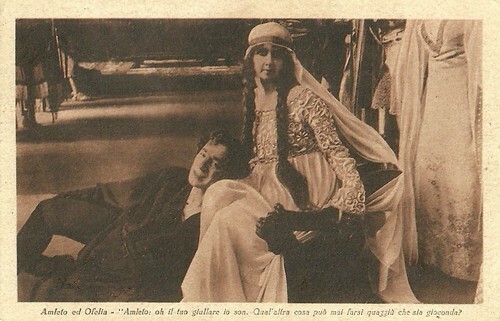 Publicity still of Helena Makowska in La Gioconda (Eleuterio Rodolfi, 1916, released 1917) with Umberto Mozzato as Lucio Settala and Helena Makowska as Gioconda Dianti. Caption: Lucio Settala is madly in love with his model Gioconda Dianti. 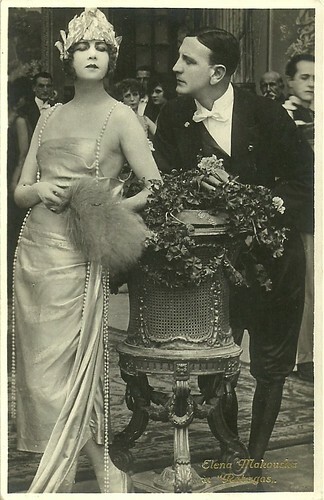 Italian postcard for the film Amleto (Eleuterio Rodolfi, 1917), adapted from William Shakespeare's play Hamlet, and starring Ruggero Ruggeri in the title role, and Helena Makowska as Ophelia. Caption: Hamlet: Oh, I am your jester. What else can one ever do down here that is joyous? 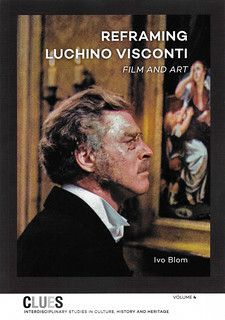 Italian postcard by Unione Cinematografica Italiana. Photo: Medusa Film. Publicity still for Idillio tragico (Gaston Ravel, 1922), based on a novel by Paul Bourget. 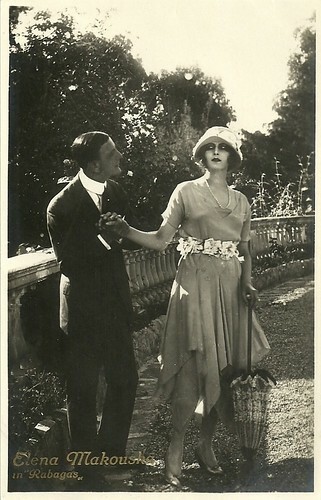 Caption: Ely rejects Oliviero, as she has now fallen in love with Pietro di Hautefeuille. 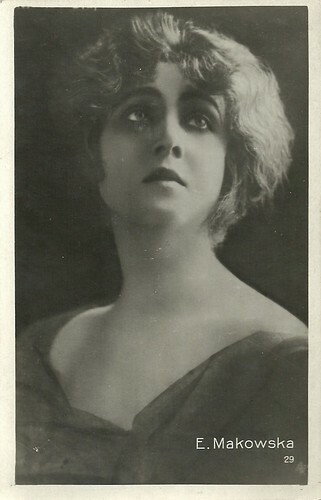 Italian postcard by Unione Cinematografica Italiana. 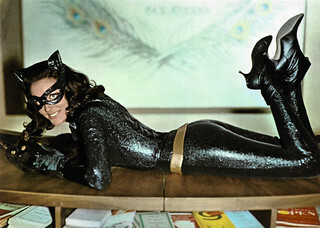 Photo: Medusa Film. Publicity still for Idillio tragico (Gaston Ravel, 1922), based on a novel by Paul Bourget. Caption: Ely's sadness after Oliviero has abandoned her. 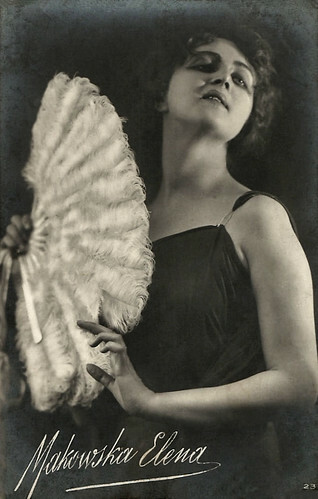 In the early 1920s, Helena Makowska moved to Berlin, where she remarried with actor Karl Falkenberg. 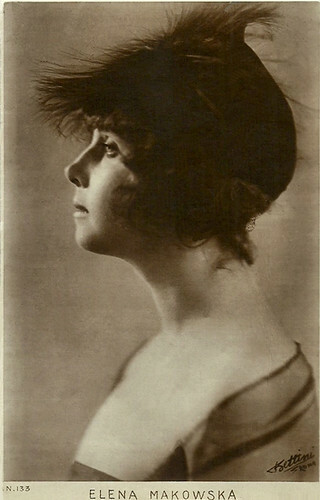 Between 1922 and 1927, Makowska played in some 15 films in Berlin and also in three in Warsaw, such as Judith/Frauen im Sumpf (1923) and Frauenmoral/Women's Morals (1923), both directed by Dutch director Theo Frenkel, Taras Bulba (Vladimir Strizevsky, Joseph N. Ermolieff, 1924) with Oscar Marion, the Stuart Webbs-detective Der Schuss im Pavillion/The Shot in the Pavillion (Max Obal, 1925), and Kochanka Szamoty/Szamota's Mistress (Leon Trystan, 1927), her last film in Poland. 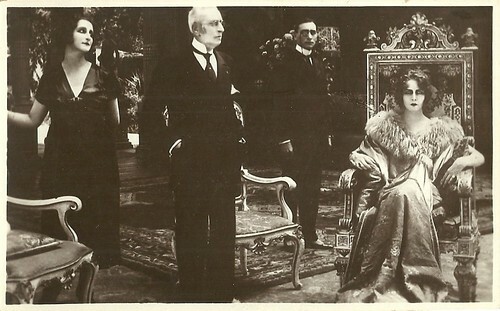 After her return to Italy, rumors started to circulate that she had an affair with crown prince Umberto. In the early 1930s she married for the third time, now with an Englishman, Botteril, and returned to Poland, as an opera and operetta singer. In 1939, immediately after the Germans occupied Poland, she was arrested as a British citizen and in 1940 she was deported to Berlin. After four years of prison camp, she was liberated in occasion of an exchange of prisoners. In England she joined the theater ensemble of the Polish army, where she performed until the end of the war. 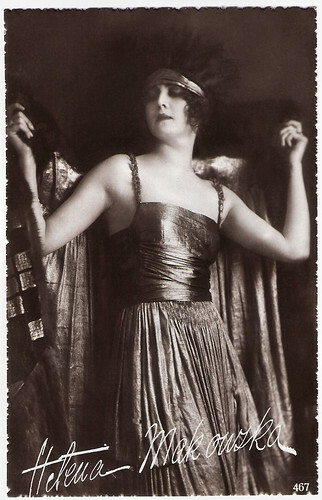 Italian postcard by Fotocelere, Torino, no. 127, with Romanian imprint by Editions SARPIC, Bucharest. 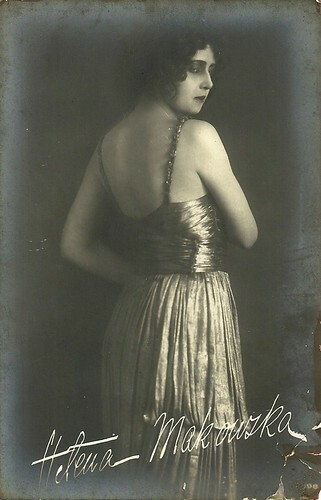 Italian postcard by Fotocelere, Torino, no. ?, with Romanian imprint by Editions SARPIC, Bucharest. 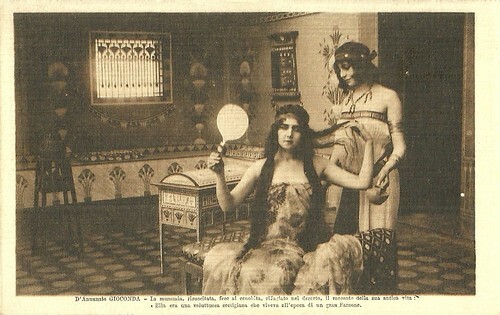 Italian postcard by Fotocelere, Torino, no. 35, with Romanian imprint by Editions SARPIC, Bucharest. 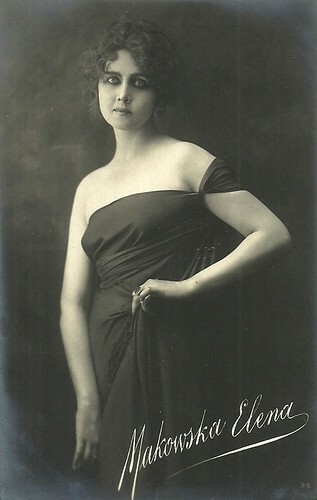 Italian postcard by Fotocelere, Torino, no. 128. Italian postcard, no. 23. Collection: Didier Hanson. Italian postcard by Ed. Fotocelere, Torino. During her final years, Helena Makowska lived in Italy, where she did bit parts in Fabiola (Alessandro Blasetti, 1948) starring Michèle Morgan and Henri Vidal, and Quo vadis? (Mervyn LeRoy, 1951) with Robert Taylor and Deborah Kerr. She appeared in Luigi Comencini's melancholic La valigia dei sogni/The Suitcase of Dreams (1953) as the aged actress of the silent era who is visibly moved by the performances of Lyda Borelli in La Donna Nuda/The Naked Truth (Carmine Gallone, 1914) and of herself in Fiacre 13/Cab Number 13 (Alberto Capozzi, Gero Zambuto, 1917), one of her most popular films. In the film of Comencini, a modern audience of the 1950s cruelly laughs about the performances of the silent actresses, but the diva of bygone days sheds a tear over so much beauty and emotion. Her final film appearance was in Arrivederci Firenze/Goodbye Firenze (Rate Furlan, 1958) with Maria-Pia Casilio. 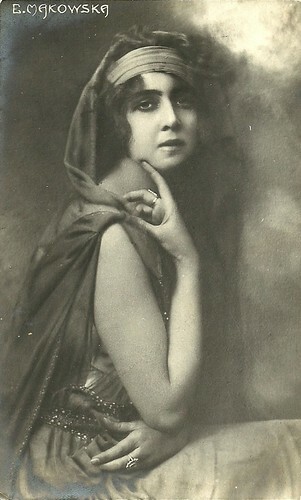 Helena Makowska died in 1964 in Rome, Italy. She was 71. 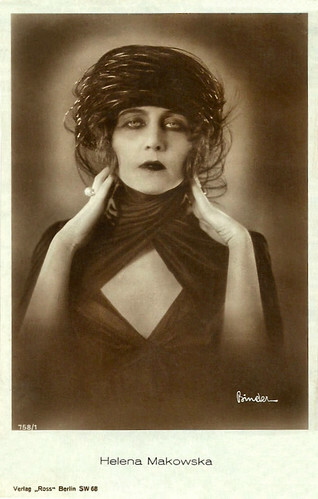 In 1999 director Peter Delpeut included footage of Makowska, Lyda Borelli, Pina Menichelli and other Italian silent film stars in his beautiful compilation film Diva Dolorosa (1999). Italian postcard, no. 133. Photo: Bettini, Roma. Italian postcard by G.B. Falci, Milano. Photo: Medusa Film / UCI. Publicity still for Rabagas (Gaston Ravel, 1922). German postcard by Verlag Ross, Berlin, no. 489/1, 1919-1924. Photo: Alex Binder. German postcard by Ross Verlag, no. 758/1, 1925-1926. Photo: Alex Binder. Collection: Didier Hanson. German postcard by Ross Verlag, no. 758/2, 1925-1926. Photo: Alex Binder. Clip from Diva Dolorosa (1999). Source: The Stat (YouTube). Source: Vittorio Martinelli (Le dive del silenzio), Wikipedia (German) and IMDb. Olá, parceiro, estou de volta, pronto para trocar comentários e seguir suas postagens. Fico feliz em ver que seu blog continua a todo vapor. Obrigado por seu comentário. Eu não poderia comentar sobre o seu blog maravilhoso. Blogger presente esta mensagem: "Este blog está sob revisão, devido a de violações de Termos serviço de Blogger e é aberta a autores somente." Espero que os problemas sejam resolvidos em breve. Força! O convite para seus 10 cartões postais favoritas de estrelas de cinema para apresentar a EFSP fica parado.